Mid Wheel drive allows for tighter turning radius. PG Controller with diagnostic fault codes. Joystick can be mounted on either side. 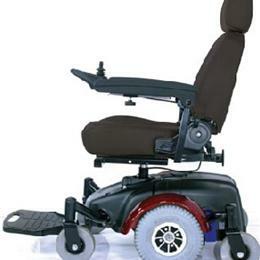 Front swivel anti-tippers have true independent adjustable suspension. Helps prevent the drive wheels from losing contact with the ground. Drive mid wheels are flat free including coil spring tension suspension. Uniquely designed Dynamic Drive suspension for greater climbing ability and comfort when traveling forward and in reverse. Front and Rear semi-pneumatic swivel wheels. Foot plate is angle, height and depth adjustable. Elevating legrest or footrest kit available (SFELR-KIT). 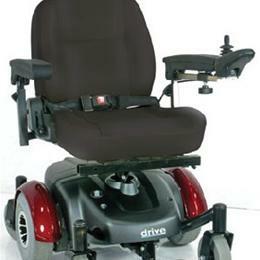 18" deluxe height adjustable swivel captain's seat (20" optional). Arms are angle, height and depth adjustable. Standard headrest is height adjustable. Seat reclines for comfort and folds down for portability. Batteries are accessible from the rear of the chair.